Jonas Green Jonas Green was a member of the early Annapolis Lodge that was chartered by Thomas Oxnard from Massachussetts. He was the provincial printer of the Maryland Gazette from 1745 to 1767. His apprenticeship was under famous US founding father and Freemason Benjamin Franklin. Alexander Hamilton Dr. Alexander Hamilton (not the first US Secretary of the Treasury) was one of the first Worshipful Masters of the early colonial Annapolis Lodge. He started the Tuesday Club in Annapolis which included several members of the Annapolis Lodge. Hamilton was married to Margaret Dulany, the half-sister of Lloyd Dulany who once owned the property where the Annapolis Lodge No. 89 Temple resides. Joseph Clark Clark was the Worshipful Master of Amanda Lodge No. 12 in Annapolis. He was an architect and builder that designed and built the current Annapolis State House Dome. He also served as the Grand Master Pro Tem. of Maryland at the US Capitol building cornerstone laying ceremony. William Pinckney William Pinckney was the first Senior Warden of Amanda Lodge No. 12 in Annapolis. He served as the US Commissioner at London, was the US Attorney General, US Congressman, Minister to Russia and Naples, and US Senator. Vachel Stevens Vachel stevens was a member of Amanda Lodge No. 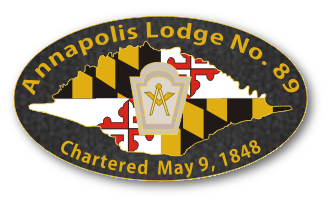 12 in Annapolis and the Senior Deacon of Annapolis Lodge No. 36. He served as the Western Shore Examiner in Maryland. Allen B. Duckett Duckett was the Worshipful Master of Annapolis Lodge No. 36 and served in the Maryland House of Delegates. He was the assistant clerk of the House of Delegates. John Johnson John Johnson was the Senior Warden of Annapolis Lodge No. 36. He served in both houses of the Maryland General Assembly, as mayor of Annapolis, as the Attorney General of Maryland, as a judge on the Court of Appeals, and as Chancellor of Maryland. Burton Whetcroft Whetcroft was the Treasurer of Annapolis Lodge No. 36 and served as mayor of Annapolis from 1808 to 1809. He also served as the Clerk for the Maryland Court of Appeals. John Gassaway Gassaway was a member of Annapolis Lodge No. 36 and was the Register of Wills for Anne Arundel county. His great-nephew, L. Dorsey Gassaway, was a member of Annapolis Lodge No. 89 and is on the deed to the current Temple. The back addition to the Temple is named the "Gassaway" room. Robert Welch Welch was a member of Annapolis Lodge No. 36 and a member of the Maryland House of Delegates. Edward Lloyd Lloyd was a member of Annapolis Lodge No. 36. He was the governor of Maryland from 1809 to 1811. He also served as a US Congressman and Senator. John Kilty Kilty was a member of Annapolis Lodge No. 36. He served as the Maryland Adjutants General and the mayor of Annapolis. John Ball Rear Admiral John Ball was a member of Annapolis Lodge No. 89. Kenmore M. McManes Rear Admiral Kenmore M. McManes was a member of Annapolis Lodge No. 89.